Minister of Education Naftali Bennett responds to article condemning national religious public as 'more dangerous than Hezbollah'. 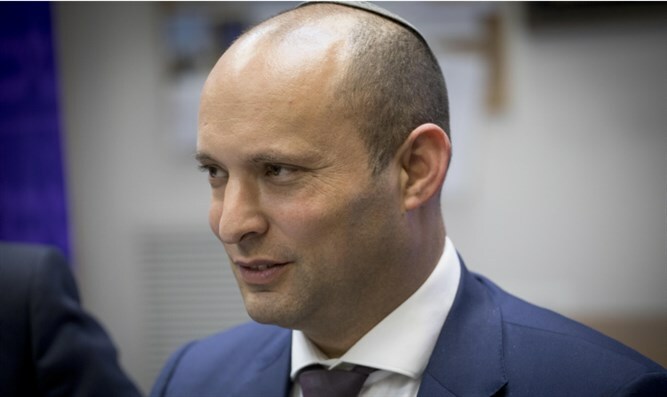 Education Minister Naftali Bennett responded Wednesday to an article published in the Haaretz newspaper in which writer Yossi Klein accused the national-religious public. of being worse than terrorist murderers. "When you think that Haaretz has reached its peak of shame, it always manages to surprise with a new low," Bennett tweeted in his Twitter account. Minister Ayelet Shaked also responded to the article and wrote, "Yossi Klein, I pity you and the Haaretz newspaper for providing such a platform." In an op-ed titled "More Dangerous than Hezbollah," whose title was later changed by the editors to "Our so-called Righteous Elite" Klein writes that "the national religious are dangerous, more dangerous than Hezbollah, more than drivers ramming their cars into people and girls with scissors. The Arabs can be killed, they can not." The newspaper changed the word "killed" to "neutralized" later on. He continues with inciteful words, writing:, "What do they want? To take control of the state and cleanse it of Arabs, if asked, they will deny it ... They know that it is too early to be so obvious. Do not believe their denials. Their religious nationalism is extreme nationalism, enveloped in a pious reverence. It permeates the education system, is getting stronger in the army and affects the Supreme Court. They are already on their way to us, another moment and they break down the door." "I have more in common with the Eskimo of Alaska than with all the [national-religious leaders] and everything they represent. What do I have to do with Smotrich? What have I got to do with Israel Harel? (a rightist Haaretz colunist, ed.) What do I have to do with those who want to achieve freedom for themselves at the expense of someone else's freedom? He did not mean us, but we are the ones who will have to get used to it," adds Klein. "We are the champions of the world when it comes to 'getting used to it,' and so we have become accustomed to the deprivation of Palestinian's freedom. So why should we not be used to the deprivation of our own freedom? We have to do to 'freedom' what they did to 'peace.' Say from now on not 'from slavery to freedom', (in the Passover Haggadah, ed.) but from 'freedom to dominance.'" Interviewed on Israel Radio, Klein stood behind his words and said that Haaretz publisher, Amos Schocken stands behind him.